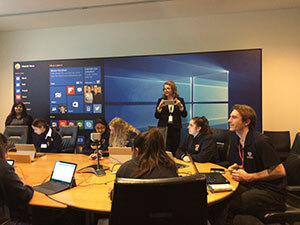 Mad Maker technical project lead Owen Brasier runs a training workshop for students at Microsoft. Madmaker is an online challenge launched by the University of Sydney last year and targeting Year 9 high school students. It is the brainchild of electrical and information technologies engineer Dr Abelardo Pardo who says that the six-week program is about teaching participants in fun, engaging ways about embedded systems and how they are used in everyday life. Dr Pardo says that many of the objects we now take for granted, like computers, mobile phones, biomedical instruments, GPS systems and robotic devices, have been developed using science, technology, engineering and maths (STEM). The MadMaker challenge allows students to use STEM subjects to solve real-world problems by exploring and designing systems with the Arduino Esplora board. The Mad Maker program is an initiative of Learning & Affect, Technologies Engineering in the School of Electrical and Information Engineering at the University of Sydney. As part of the challenge, students work in pairs using the board connected to a regular computer. The board includes sensors for temperature, sound, light and movement, as well as a joystick. The application to write programs is open source and can be installed on a conventional computer. Dr Pardo picked Arduino Esplora boards because they are an introductory level device, inexpensive and a powerful learning tool. The challenge was designed with input from teachers across Australia to be used as a STEM teaching tool that could fit the various needs of different schools and teachers. “We conducted ‘participatory design’ programs with high school teachers through focus groups and discovered that teachers above all needed a product that it is easy to use, is reliable and does not involve expensive hardware,” he said. The long and intense preparation period including talking to the teachers, hosting the workshops, getting the Arduino Esplora boards, assigning the school grants and deploying the course material paid off, with 160 classes signed onto the program in its first week last October. Since then hundreds of students and teachers have joined the program’s virtual community to tackle activities proposed in the challenge. Participating teachers are provided with training to acquire the skills they need to deliver the six-week program in the class room. Importantly, teachers are given the opportunity to use the challenge to design an activity themselves that they can take back to their classroom. Mad Maker also uses a multidisciplinary approach so that it is not just the STEM teacher expected to deliver the program in class. Dr Pardo and his colleagues have evaluated the program extensively and found that many teachers have elected to use the program for assessment, indicating the level of seriousness with which the program has been received. With 131 schools engaged so far and the program delivered in 195 classes to 3000 students working in pairs, Mad Maker is now moving on to the next phase of its national roll out.